For the past two years HellasFrappe has been publishing stories focusing on the reasons behind the downfall of the former conservative government of Costas Karamanlis. At the beginning, these stories were viewed as conspiracy theories and some of our readers thought we had overdosed on David Icke shows and reptilian theories, but later on publications in prominent magazines such as Epikaira, and Crash, only came to confirm what we were saying all along. 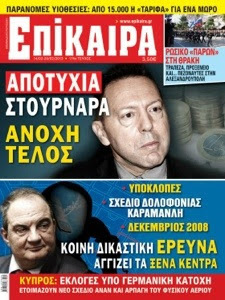 At the same time, these magazines made startling revelations that spoke about the infamous wiretapping scandal (with direct accusations against the American Embassy in Athens), the reasons for the December riots of 2008, the assassination attempt against Costas Karamanlis and the controversial and disturbing "Pythia plot" which aimed at destabilizing Greece's social, economic and political climate. On Thursday Epikaira released another issue proclaiming that the Greek justice system has decided to merge these cases into a mega investigation and after months of gathering evidence is now convinced that foreign interests were involved on all fronts. Over the past few months, the Greek justice system has been investigating many scandals and so far our lawmakers have yielded serious results. Their latest decision to link all these cases (because some were already being investigated separately), is definitely something that wasn't expected, and something tells us that the results of this massive investigation will definitely change Greece's political and business landscape once and for all (taking out all the weeds). And we here at HellasFrappe say it is ABOUT TIME! We feel justified because we knew from day one that the reasons that led to the downfall of the Costas Karamanlis government were related to Greece's energy and foreign policies. Aside from being fans of the former PM (and we are not ashamed to say that), we also knew that his veto at the 2008 NATO Summit in Bucharest against FYROM was the start to his end. Also, when he went up against Greece's television and construction oligarchs, and when he decided to send all the arms deal contracts to be investigated we knew that they would fight him square on. And they did. Today these cases -after years of being investigated because of Karamanlis- are being revealed. They are obviously not a result of the Papandreou government, because Mr. Papandreou was just an extension of the Simitis era (which has already been signalled out for some 30 scandals). Besides, we never trusted Papandreou because of his positions on the Cyprus Anan issue, the Helsinki agreement, etc. By going through the news every day we knew that there was a massive plan because under Papandreou's rule Greece was transformed from a proud nation, and future energy hub, into a beggar and experiment of global bankers. And today, as you all know, Papandreou is gallivanting across the world, lecturing and flaunting his wealth, while Greek citizens scrape garbage bins for their next meal. The IMF, the Memorandums and the bailout agreements did not spring up by chance, or were the result of the "global economic crisis" as some people still want to think, they were and are part of a plan to destabilize our nation and bind it from head to foot on all fronts. This is why Papandreou chose to announce our entrance to the Memorandum from Kastelorizo, sending out a clear message to all interests that Greece will comply. Indeed, the NWO worked its magic in this country, and implemented its plan carefully and with unprecedented cruelty. Today, all these policies have caused a humanitarian crisis in a nation which has a history of standing proud. All those who still claim that these are just mere "conspiracy theories" are either well paid to say so -in a pitch to ridicule all the information that has been publicized already-, are part of a rotting system that has invested highly to witness Greece's overall destruction -with the aim of taking back to the drachma-, or are simply to blind and ignorant to separate the forest from the trees -meaning are too uneducated to read a newspaper-. Well, all of this is about to change because Greek prosecutors are ready to finally (and bravely) act. The current Epikaira issue, which reveals this information, is a historic contribution to the truth, and the details outlined in this new controversial investigative report are indeed enlightening, but at the same time can totally enrage even the most benevolent citizen of this country. All three cases (2008 December riots, Wire-Tapping Scandal, and Pythia Plan) all merged into one massive investigation by the Prosecutor of the Hellenic Supreme Court. The integration and correlation of files, on the one hand documents the motives and deceit committed in all three cases, and on the other intends to present dramatic evidence as to the "why" or the background of all three cases. The names of foreign intelligence agents involved in these cases will be revealed. A document will be presented which proves that George Papandreou was well aware about the "postponement or total dismissal" of various policies that dealt with several Greek pipeline agreements (especially those signed between Greece and Russia). Information will be presented about mysterious Cypriot deposits that in return reveal other startling evidence. Evidence will be shown that proves Costas Karamanlis was instructed in February 2009 to avoid any movement in Athens (in other words was warned to take security measures), and this resulted in confining him only at the Maximos Mansion and his home in Rafina (giving the opposition and the media a reason to say that he wasn't active and was worn out). Evidence will also be presented which proves that specific "journalists" were collaborating with foreign centers (against the government at the time as well as Greece). For instance, when Wikileaks published a cable outlining that foreign powers had baptized Karamanlis "Buddha", there were (idiotic) reporters who used this characterization the very next day, thus creating strange connotations. (Yes, all those who used this characterization, were indeed that stupid ). Evidence will also be presented about a bomb that was discovered at a shipowners dinner gala but which was luckily removed before being detonated! New shocking testimony will also be heard from the former head of the Greek Intelligence Agency Mr.Korantis (who later became an MP with the LAOS party). And many other aspects of the case will be presented. The case is not about justifying what we here at HellasFrappe have believed all along, nor is it about vindicating Costas Karamanlis, it should concern every Greek citizen who has been fed lies and propaganda for years. This plan, dear friends, was not about ending some pipeline deals, and it sure as hell was not only about toppling a government or a political leader, it was also about the greatest scam -or heist- of the century and should concern ALL OF US. In fact it is so big, that it can only compare with the total destruction and looting of the former Soviet Union. The material that is presented by the Epikaira magazine, and that will be published on HellasFrappe over the next few days, decodes the sequence of all these events and is going to open the doors to hell for many elite circles in Greece who have been feeding Greek citizens bullsh**t for years. Those who continue to insist that this is all a conspiracy theory, do not want you to focus on the truth. Only an idiot would believe at this point that all of this was a coincidence of events. Stay tuned frappers... It is time for heads to roll! The Following song is dedicated to the Simitis-Papandreou regime -and especially the interests that supported them all these years-, for the stock market scandal of 1999, for the Ktimatiki Scandal in New York where millions were stolen from the Greek Diaspora, for handing over Kurdish leader Ocalan to Turkey, for signing and agreeing to the Helsiniki agreement which painted grey zones in the Aegean, for cooking the books with Goldman Sachs in 2000 to place Greece into the Eurozone, for apparently accepting kickbacks in result to shady defense contracts, for allowing specific elite families to profit from the Athens 2004 Olympic games, for giving out state construction works to high and mighty television network owners, for conducting secret diplomacy on the issue of FYROM, and Greek Turkish relations, for not allowing Greece to proclaim its EEZ, for baptizing illegal immigrants "Greeks" so as to score more votes, for working hard at not allowing Karamanlis -who was their only enemy- to take our country forward -free from interests-, and especially for lying to us and telling us that the Greek flag on Imia fell off due to the wind while we all know they bowed to foreign interests resulting in the death of three innocent soldiers. We have never forgotten. WE WILL NEVER FORGET. The investigations might of taken several years to unfold and although many believed that Karamanlis did nothing to promote these investigations, we want to remind them that investigations of this magnitude take years to unravel. Nonetheless, justice will finally prevail! The spark has been ignited by our lawmakers who are today making history by following their Italian counterparts -who we all know brought down the entire Italian mafia-. An inferno is now in clear site... It is time for this regime to BURN, one floor at a time. We suggest that you read the following articles -already covered by HellasFrappe- for the background to this story. Was Mossad, MI6 & CIA Behind Assassination Plot Of Karamanlis? Does Papandreou agree with Rondos’ views about sharing the Aegean with Turkey? Tobras To Stournaras - "Karamanlis Never Handed Over The Keys Of Greece To Its Creditors"